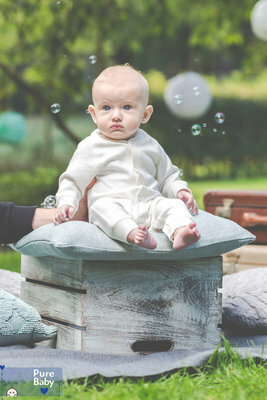 The Pure Baby Love Baby Jumpsuit is made of 100% organic cotton. It is ultra-soft and has a perfect fit for your little one. The baby jumpsuit is extremely user-friendly. Changing diapers has never been so easy, thanks to the press-studs. Even dads will be more than happy to change diapers! The wonderful off-white colour fits all your other baby clothes and looks wonderful on the skin colour of a (newborn) baby. The baby jumpsuit is a versatile item in your baby’s wardrobe. It can be used by day as regular outfit, in the baby wrap and at night as pyjamas. Kids wearing washable diapers also love the fit of this beautiful jumpsuit. The baby jumpsuit is available in size 44 (premature/dysmature), 50-56 and 62-68. Our Baby Jumpsuit is available in size 44 as well. Perfect for premature babies in the incubator. The press-studs allow you to dress your little one, while staying connected to all the equipment. A premature baby will definitely love this ultra-soft jumpsuit. In short: our ultra-soft baby jumpsuit is indispensable in your baby’s wardrobe. 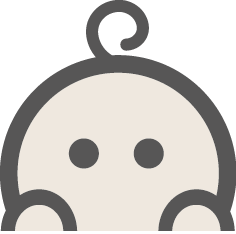 Buy the Pure Baby Love Baby Jumpsuit now!